This page is for individuals who are looking to obtain their Operator-in-Training (OIT) certificate or licence, Limited certificate, or Water Quality Analyst (WQA) certificate for the first time. After having read the Who are Operators? section of this website, you should have a basic idea of which certificate(s) or licence(s) you wish to obtain. Successful completion (70% or higher) of the relevant exam. *If you have education other than an Ontario Secondary School Diploma, are unsure if your education can be accepted for proof of grade 12, or are applying for a Limited certificate, please see Guideline 3.1 available in the Detailed Guidance Documents section for more information. Please note that the above is NOT a detailed list of all the steps needed for each certificate or licence. Continue reading for a more comprehensive explanation. An individual holding an OIT certificate or licence is considered an operator and can obtain valid operational experience to upgrade to a class 1. The OIT Exam To obtain your OIT certificate/licence in one or more of the four system/facility types, you must first apply to write the OIT exam by completing the Operator-in-Training Examination Registration Form. With your application you will need to provide proof of grade 12 or equivalent and submit a payment. 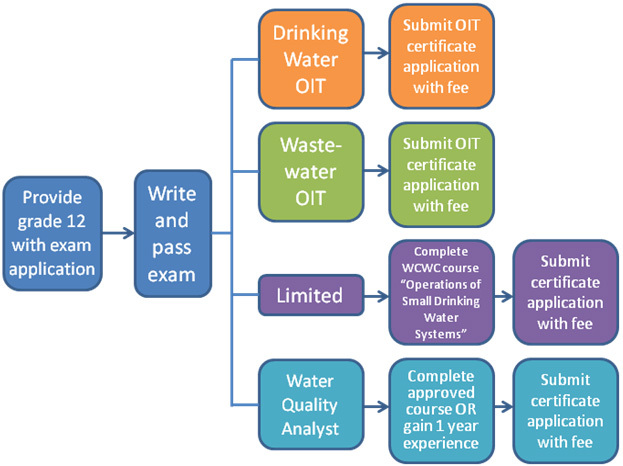 In addition to 40 general questions, the OIT exam consists of four sections or modules: Water Treatment, Water Distribution/Supply, Wastewater Treatment and Wastewater Collection. Each module corresponds to a type of drinking water certificate or wastewater licence. For example, if you choose to only write the wastewater treatment module and pass it, you are only eligible for the wastewater treatment licence. You may choose to write any combination of the above modules from one to all four in a single exam session, however, the exam is marked as a whole and you will receive a single mark. Passing the exam allows you to obtain the certificate or licence for each module you wrote. Regardless of how many modules you choose, the examination is 3 hours in length, and the fee to write the exam remains the same. See the fees and forms in the Application Fees, Process, and Forms section below. You must indicate which modules you would like to write in Part B of the Operator-in-Training Examination Form. Exam applications must be submitted at least one month in advance of the date you wish to write. You can view upcoming examination dates on the OWWCO Examination Schedule. Study manuals for the OIT exam are available for purchase through the OWWCO office. Please visit our Study Guide Page for further details. When applying to write the OIT exam, you may also apply for your OIT certificate(s) by completing Part C of the Operator-in-Training Examination Form. Payment can be made by Visa, MasterCard, cheque, or money order. If paying by cheque or money order, please make the payment out to the Minister of Finance. Exam applications may take up to 30 days to process, and OIT certificate issuance may take up to 7 business days on receipt of a COMPLETE application and payment of the correct fee. Incomplete applications may be returned. Wastewater OIT licences are valid for 3 years and may be renewed at the end of that period regardless of whether you have gained operational experience or not. See the fees and forms in the Application Fees, Process, and Forms section below for information on the cost of each OIT certificate or licence. Payment can be made by Visa, MasterCard, cheque, or money order. If paying by cheque or money order, please make the payment out to the Minister of Finance. OIT certificates may take up to 7 business days to process on receipt of a COMPLETE application and payment of the correct fee. Incomplete applications may be returned. Drinking Water OIT certificates are valid for 3 years and may only be renewed once with a valid Entry Level Course (ELC) certificate. The Mandatory Entry Level Course The Entry Level Course (ELC) is required for all drinking water operators. Click HERE for more information. Next Steps Once your OIT certificates or licences have been issued, you are eligible to obtain operational experience. A minimum of one year of experience is required for any Class 1 certificate or licence. For example, if you are working in water treatment, you must have one year of operational experience in water treatment under a valid water treatment OIT certificate before you can consider upgrading to a Class 1. Visit the Upgrading Your Certificate/Licence section of our website for more information. Please note: Rewriting the OIT examination will not result in the reissuance of an expired certificate. See Guideline 2.4 – Drinking Water OIT Requirements for more information. Background Not all operators work in large municipal systems. If you operate or intend to operate one of the systems in the chart below, you may be required to obtain a trained person designation, or Limited System certificate. *A drinking water OIT may operate a limited subsystem if they are under the supervision of an Overall Responsible Operator and Operator-in-Charge who holds or is deemed to hold a limited subsystem certificate for that type of limited subsystem. If you will not be operating a facility, but plan to take chlorine residual or turbidity tests in one of the systems below, you may be required to become a supervised person. Additional information on Limited System operators, trained persons, and supervised persons are available in the Small Water System section of this website. Background Any water testing and/or analysis prescribed by O. Reg. 170/03 must be done by a person or laboratory holding a ‘drinking water testing services’ licence issued by the ministry. However, a Water Quality Analyst certificate allows the holder to conduct testing for the 24 operational parameters listed under subsection 2(1) of the Drinking Water Testing Services regulation, O. Reg. 248/03, which can be done by a qualified person (e.g. testing for chlorine residual, turbidity, alkalinity, pH). Please note: a “qualified person” includes a certified drinking water operator (including an operator-in-training), and a water quality analyst (WQA). The Exam To be eligible for a WQA certificate, you must successfully write the WQA examination as well as complete a ministry approved course for WQAs before applying for your certificate. Information on these courses can be found in Guideline 3.3 in the Detailed Guidance Documents section of this page. Exam applications must be submitted at least one month in advance of the date you wish to write. You can view upcoming examination dates on the OWWCO examination schedule available here. Information on the examination process can be found on our Writing an Examination page. Next Steps The Director will issue a WQA certificate provided the applicant meets all the qualifying requirements. Please see the Upgrading Your Certificate/Licence section of our website for more information on the requirements to obtain a WQA certificate and how to submit your application. Here you will find the forms mentioned in this section along with the fees for each of the above mentioned types of certificates and licences. If you need more information about any of the requirements to obtain your certificate or licence, or if you feel your situation does not fall into the above categories (i.e., you work part time, work in multiple types of facilities, etc. ), the following documents may provide you with clarification. Guideline 2.4 – Drinking Water OIT Requirements This guideline provides information on the requirements to renew or restart Drinking Water OIT certificates. Guideline 3.1 – Grade 12 Equivalency If you are unsure if your education meets the requirements for grade 12, review this guideline to see what can be considered equivalent. Guideline 3.2 – Limited System Director Approved Course of Study This guideline identifies the course which is considered Director Approved in order to achieve a Limited System certificate. Guideline 3.3 – WQA Experience and Director Approved Course This guideline outlines the experience and training requirements to obtain a WQA certificate. Guideline 3.9 – Trained Person Designation This guideline defines how to obtain and maintain a trained person designation. Guideline 3.11 – Exam Result Validity Defines the length of time an exam result remains valid for. Guide to Drinking Water Operator Training Requirements Explains the training requirements and process to renew Water Quality and Drinking Water certificates (Class 1 – 4 and Limited Systems). Preparing for Your Exam Includes a list of the appropriate study materials for each type of exam. Steps to Become a Limited System Operator Step-by-step procedures on how to become a Limited operator. Steps to Become a Supervised Person Step-by-step procedures on how to become a Supervised person. Steps to Become a Trained Person Step-by-step procedures on how to become a Trained person. Starting July 1, 2017, all new drinking water Operator-in-Training certificates will be issued for 36 months. Temporary certificates will no longer be available.